You know how once you buy a 'red XYZ car', then you suddenly see lots of them where before you hadn't noticed them, infact, everyone seems to have one....? Well, we now spot airships. Like this one in our local grocery store. 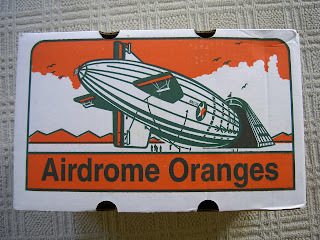 We're not sure what message about the greatness of these oranges is conveyed by having a 785ft long airship on the packaging*, but it looks cool. But I would like more about you, who you are, what your plans are and so on. I would like to do a little portrait of you and your project. Would be cool if you where interested. Please contact me via my blog there is also my email-address.